The Delfonics is the quintessential sweet-soul group. Hailing from Philadelphia, the crew formed in the mid-'60s, with the definitive original lineup as lead vocalist and songwriter William Hart, his brother Wilbert Hart, and mutual high-school friend Randy Cain (later replaced by Major Harris). With the help of producer/arranger Thom Bell—and with William's signature falsetto—the Delfonics set the tone for all other sweet-soul groups that would follow. Los Angeles producer/composer Adrian Younge envisioned a modern-day Delfonics album and pitched the idea to William Hart, who hopped a plane from Philly to L.A. and began work on a new album. Younge helped to reshape the Delfonics by bringing on board two excellent young vocalists, Loren Oden and Saudia Mills—as well as Om'Mas Keith on the single "Stop and Look (And You Have Found Love)"—to work alongside William. From the very beginning, it was Younge's intention to create an old-school Delfonics vibe but offer a very hip-hop-informed perspective. 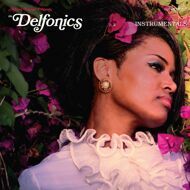 There are distinguishing musical elements that Delfonics fans will recognize, like the electric sitar guitar, the French horn, string arrangements, and the tympani. Now the instrumentals are finally available.